An easy-to-use formula that is perfect for frequent use to clean hair without water. Ideal for people in a hurry or those confined on their beds, who are unable to wash their hair. How does it works? 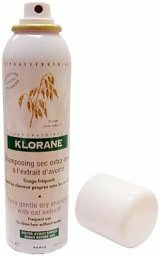 When sprayed directly onto hair Klorane Oat Extract Dry Shampoo penetrates the hair absorbing dirt and hair products. When brushed out, Klorane Oat Extract Dry Shampoo takes all these impurities with it, and you are left with soft, clean hair. This dry shampoo is based on softening, protective oat extract, cyclodextrins and natural polysaccharides to clean the hair without washing, as often as required. The hair regains volume and lightness within minutes. Quick and practical to use, suitable for busy people or the bed-ridden, who cannot wash their hair.